I’d read this many years ago. Decades, really. But my new housemate has a whole bunch of books from the series so I figured I’d read them and needed to refresh my memory of the first. 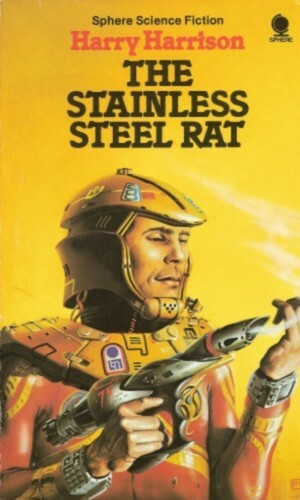 The Stainless Steel Rat is an adventure novel about an anti-hero space criminal dragooned into working for an interplanetary agency created to capture criminals like himself. Fun but predictable, it relies on the inherent sexism of the 60s in it was written to hide a twist which is pretty obvious today. The setting has some issues, with Harrison making a big deal of Slippery Jim “The Stainless Steel Rat” Di Griz being an aberration – a free thinker in a tightly controlled universe – making him a criminal and able to out think the standard law enforcement, but, everywhere he goes seems to be full of criminal behaviour, necessary for story reasons but completely contradicting the basic set up. The world on which the second half of the story is a backwater plan so gets away with it a little. More interesting than the anti-hero or the villain is Innskip, the head of Special Corps and a former criminal himself but unfortunately gets very little time on the page. A fun read to pass the time.